[JULY 28, 2004] The Oasis, Logan County's senior citizen center, 501 Pulaski St. in Lincoln, is open weekdays (except holidays) from 9 a.m. to 4 p.m. 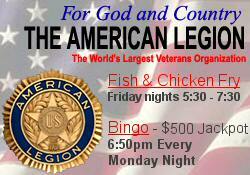 The center is also open on Friday and Sunday nights for table games. Dominic Dalpoas is the executive director. Activities are open to all Logan County senior citizens, regardless of membership. Pick up your $3.50 ticket by noon Monday, Aug. 2, for a BLT sandwich, California salad, drink and dessert. Call 732-6132 for an appointment to have your prescriptions, over-the-counter medications and herbal supplements checked for drug interactions. The pharmacist is available from 1 to 3:30 p.m. Aug. 3. Call 732-6132 for an appointment to have your hearing checked on Aug. 4 between 10 a.m. and noon. Maple Ridge will serve a light lunch on Aug. 5 at 1 p.m. for bingo. There will be finger sandwiches, chip dip, a vegetable tray and soft drinks. Reserve your seat by Aug. 13 to see Archie meet the mob in "All in the Mafia Family" at the Die Laughing Dinner Theater in Alton on Aug. 20. Transportation, meal and show ticket are included at $42 for members, $44 for nonmembers. Aug. 20 is the reservation deadline for the trip to Hillsboro, Ind., to see "Donna’s Mustard Seed." Transportation, meal and show ticket are included at $43 for members, $45 for nonmembers. Linda Hughes and Henry Warnisher were the weekly pinochle winners. On the weekend Paul Klemm and Pauline Boward won. The weekend 5 in 1 winners were Bernie DePuy and Dorothy Oltmanns. Friends of The Oasis members receive a bimonthly newsletter by mail. For more information, call 732-6132 or 732-5844.